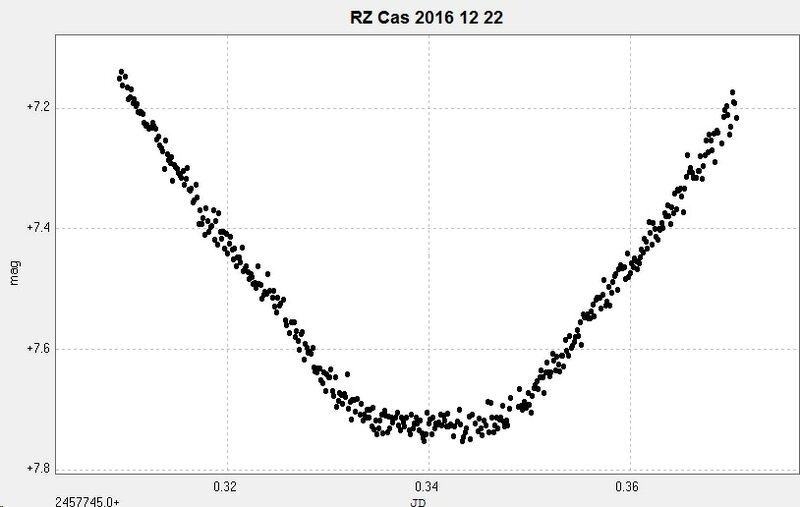 Light curve of a primary minimum of RZ Cas on 2016 December 22 from 413 unfiltered images taken with the 2" Titan at Somerby Observatory. 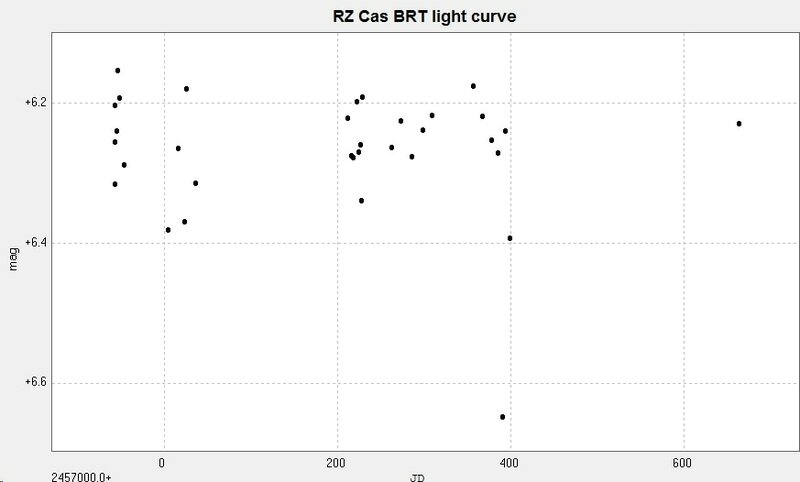 Light curve of a secondaty minimum of RZ Cas on 2017 October 15 from 1002 unfiltered images taken with the 2" Titan at Somerby Observatory. 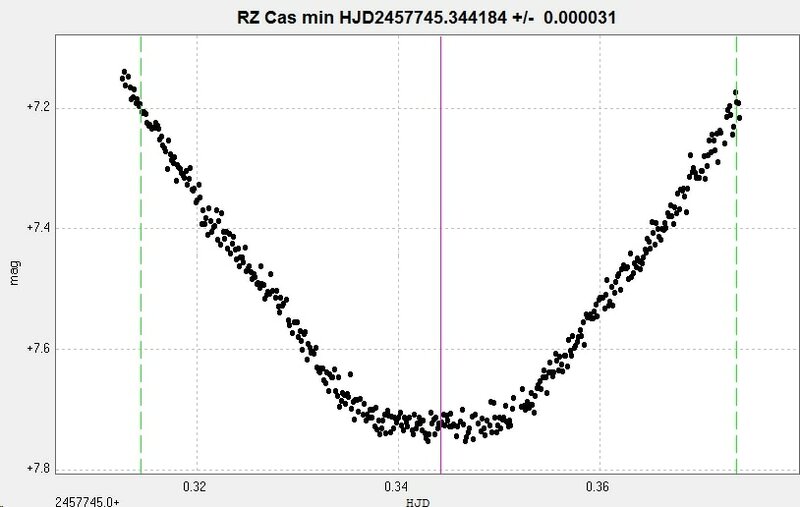 The 'sinusoidal' modulation of the curve has a period of 0.0156d (=22.5 minutes) and is probably due to variations in one of the components which is a delta Scuti type variable. 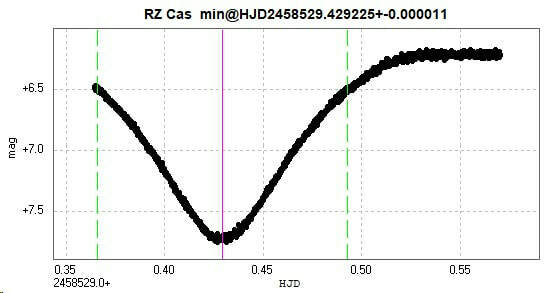 Light curve and phase diagram of RZ Cas from photometry of 33 images taken with the Cluster Camera of the Bradford Robotic Telescope, using a tri-colour green filter, between 2014 October 12 and 2016 October 1. 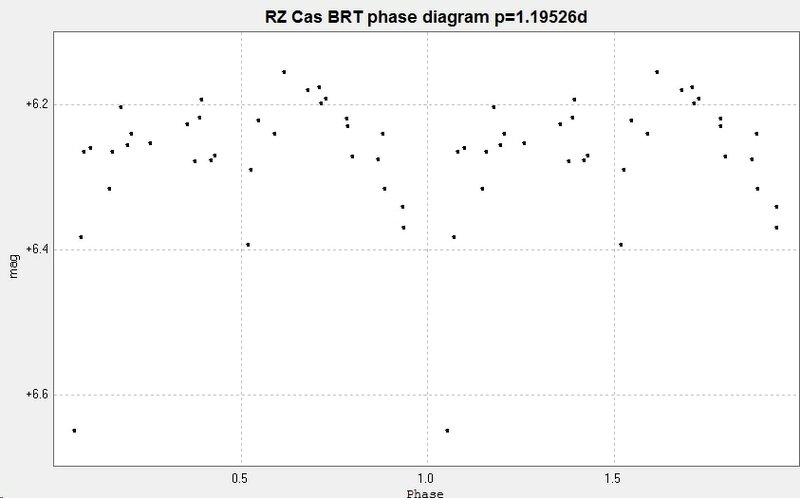 Combining the above three sets of data results in the following light curve and phase diagram. The Bradford observations are in black while the Somerby observations are in red (primary minimum 2016 Dec 22) and blue (secondary minimum 2017 Oct 15). 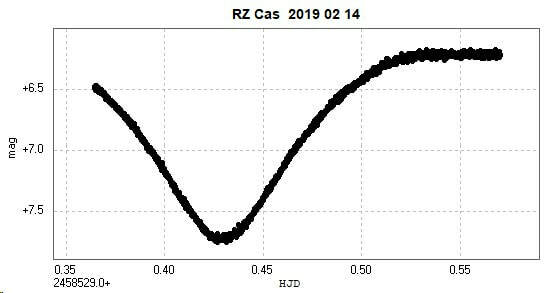 A primary minimum observed with the 2" Titan at Somerby Observatory on 2019 February 14. The images were unfiltered (ie CV). 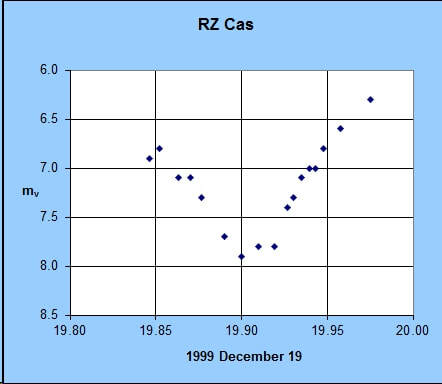 The catalogue values for the period are 1.1952503d (GCVS), ​1.195247 d (AAVSO VSX) and 1.195265 d (Kreiner) (accessed 2017 February 9). 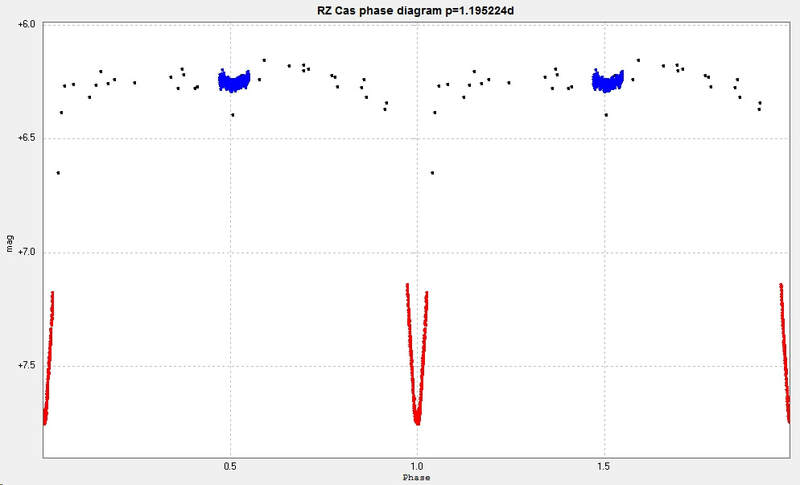 ​There is o-c activity with this system (GVCS, Kreiner). 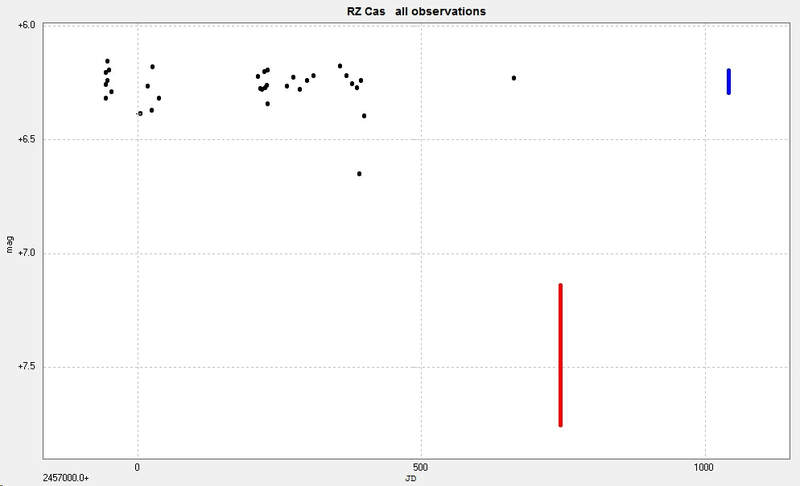 This is an example of a visual observation of a primary minimum I observed from Leicester, UK, with a pair of 7x50 binoculars.